On the evening of February 4, 1924, Father Hubert Dahme walked in downtown Bridgeport (as he frequently did) when a man approached him from behind and fired one round from a .32 caliber revolver. The bullet struck Dahme, a popular priest at the city’s St. Joseph Roman Catholic Church, behind the left ear. The assailant immediately fled on foot as passers-by and people in the nearby Lyric Theater (waiting for the curtain to rise on a play starring Ethel Barrymore) rushed to Dahme’s side. In the confusion, no one called for medical attention for nearly 10 minutes. The priest died two hours later at St. Vincent’s Hospital. Twelve thousand people attended Dahme’s funeral several days later. Then on February 12, police charged a 20-year-old army veteran named Harold Israel with Dahme’s murder. Israel was in jail in Norwalk at the time—arrested several days earlier on a weapons possession charge. Four people identified Israel as the man who ran from the site of the murder. He was known to have been in the area at the time and he owned a .32 caliber revolver. Israel eventually confessed to the crime. Homer Cummings, State Attorney for Fairfield County, later stated that the case against Israel looked perfect. On May 27, 1924, however, just 15 weeks after authorities charged Israel, Cummings walked into a Bridgeport courtroom and shocked everyone present by declaring the murder charges against Israel dropped. Cummings, after meticulously reviewing the case against Israel, found it seriously flawed. Part of the problem occurred when ballistics experts called on by Cummings contradicted evidence provided by police about the weapon found in Israel’s possession. In addition, Cummings noted that several doctors determined that Israel confessed to the murder only after many hours and because he wanted the interrogation to stop so he could sleep. The doctors also noted the low mental capacity of the suspect, who local newspapers regularly referred to as a “vagrant” and a “moron,” and that also influenced Cummings’s decision. Authorities soon released Israel, who was serving a 90-day prison sentence on the weapons charge when Cummings made his determination. Police continued to investigate Dahme’s murder but no other arrests ever came. Revived interest in the case came two decades later, however, when Rotarian magazine published an article by Anthony Abbot in December 1945 entitled, “The Perfect Case,” about Dahme’s murder and Israel’s arrest and subsequent release. Abbot was a pseudonym of Fulton Oursler, a journalist and playwright who later wrote The Greatest Story Ever Told. Reader’s Digest published a condensed version of the article soon thereafter and 20th Century Fox purchased the movie rights to the story. Scriptwriter Richard Murphy adapted it for the screen and director Elia Kazan began shooting in 1946. Mayor Jasper McLevy and other Bridgeport officials refused to allow Kazan to film in that city, fearing adverse publicity, and a good portion of the movie ended up shot in Stamford where Cummings served three terms as mayor. 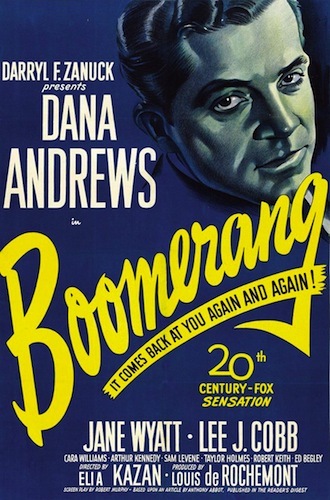 Titled Boomerang!, the film featured Dana Andrews, Arthur Kennedy, Jane Wyatt, Lee J. Cobb, Karl Malden, and Ed Begley. Also appearing in a non-speaking, uncredited role was playwright Arthur Miller, a friend of Kazan’s who catapulted to international fame a few years later with Death of a Salesman. A showing of Boomerang! 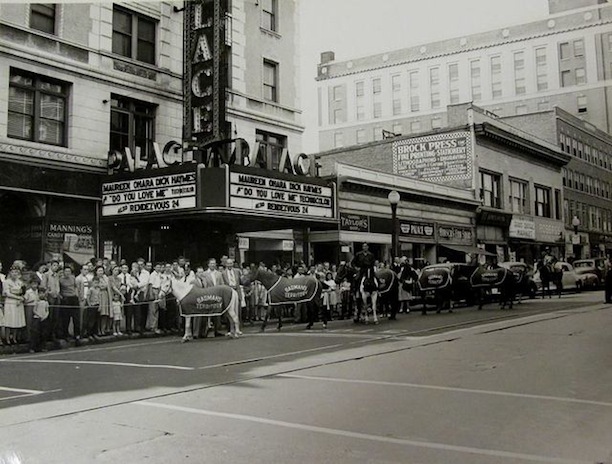 took place at the Cannes Film Festival in 1947 and the film made its US debut on March 5 of that year at the Palace Theater in Stamford (with Kazan and Andrews among those in attendance). For his efforts, Murphy received an Academy Award nomination for Best Adapted Screenplay. Kazan also received a nomination for, and won, a Best Director Academy Award that year, though it was for Gentleman’s Agreement, not Boomerang!. Israel received $18,000 from 20th Century Fox but insisted that his name not be used in the film. Writers named the murder suspect in Boomerang! “John Waldron.” A waitress named Nellie Trafton, who told police immediately after the murder that she knew Israel and saw him the evening of the killing, threatened to sue 20th Century Fox over the portrayal of the waitress “Irene Nelson” in the movie. The studio eventually paid her $1,200. Harold Israel died in 1964 at the age of 61. For his part, Homer Cummings actually went on to greater fame after President Franklin Delano Roosevelt appointed him Attorney General of the United States in 1933. Ninety-one years after Dahme’s murder and 67 years after the release of Boomerang!, people in Bridgeport and Stamford remain interested in the case. The fact that libraries and movie theaters in both cities continue to screen the movie regularly attests to this. Aquino, John. Truth and Lives on Film: The Legal Problems of Depicting Real Persons and Events in a Fictional Medium. Jefferson, NC: McFarland, 2005. “100 Police Watch At Dahme Funeral: Eye Witness of Murder Hides Behind Screen in Church.” Hartford Courant. February 9, 1924. Abbott, Anthony. “A Perfect Case.” Rotarian, December 1945. “Israel Confesses Fr. Dahme Murder: Obeyed ‘Irresistible Impulse’ to Kill Someone, Slayer Says.” Hartford Courant. February 16, 1924. “Saved From The Hangman’s Rope: Harold Israel, Apparent Murderer, Freed by State’s Attorney’s Amazing Probe.” Hartford Courant. April 19, 1925, sec. D1.